Last week, I reintroduced a special WrestleMania 35 edition of Bookie .vs. Blogger where the Bookie not only took on myself but also two frequent visitors of WWELeaks.org. As all four of us live in different countries, I thought it would be good to have us represent the four nations. The bookie was England, I was Wales and the two other competitors were Ireland and Scotland. Then, as is the rules of Bookie .vs. Blogger, we ranked our picks from the fifteen matches that were confirmed at the time of our entries with the person - or persons - we felt had the strongest chance of winning getting fifteen points all the way down to the wrestler/s we thought had the least chance of winning getting one point. After all the match results were tallied up, Scotland came out a winner with 88 points. Next up was the other punter - representing Ireland - with 79. I was next with 77 followed by the bookie with 69. 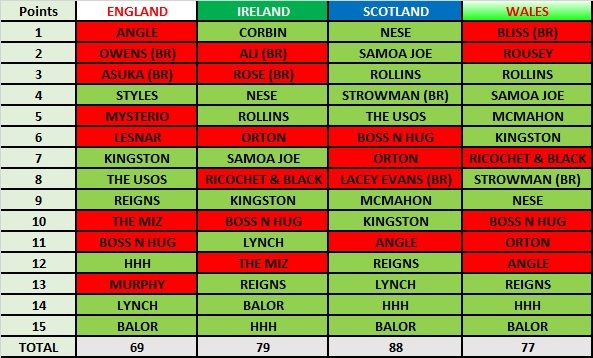 All of our picks - along with how many points we gave to them - can be viewed in the table below. Annoyed Richochet and Black couldn't get the job done too, I felt the build up was for them to win the titles here - but with all the baby face winning titles, there had to be some cutbacks. Makes me wonder if Usos were originally dropping the titles at wrestlemania but due to Kofi, Becky, Seth, finn etc all winning titles they saved it for Smackdown. I was surprised to see AJ win as I thought the match was just to set up an early "OMG!" Moment, but I suppose Seth took that spot. Yeah, Angle was my biggest mistake. We saw the visual tap on the Monday beforehand, but I still kept reminding myself that Angle promised to tap him out in the match. I thought there would be more of a celebration after the match. Not making excuses, but.. I really should have given more points to Strowman than I did. That was the one result I was the most opinionated on when I discussed it with people. Not that it matters. I still would have lost!